Visiting Portugal had been a dream for as long as Jill can remember. It hardly seems possible that we had not visited this country with all the time we've spent in Europe. Well, it was high time we changed that. Portugal was everything we wanted it to be and more. This little country has so much to offer - various types of beaches and coast, wine, port, major cities, castles, walls, valleys, hills, you name it, Portugal has it. The food ranks up there with some of the best we've ever had. We were a little bit worried about the food initially because everything that we read focused on pork dishes. Jill does not like pork so was a bit concerned about what she was going to be able to eat. Fret not! We found many amazing vegetarian and vegan options in Porto and Lisbon. Oh, and there's also so much seafood and fish to be had, including the ubiquitous bachalau. We also found the Portuguese people to be among the most friendly and welcoming we have ever encountered. Everyone was truly kind and very helpful even when we seemed to have no idea what was going on. So next time you find yourselves wondering where you should go, we say go to Portugal. We're trying to figure out when we can make it back. Read, see and hear more about the regions we visited in Portugal. An overview of our time spent in the Douro Valley in Portugal. We loved this wine rich region and found it absolutely beautiful. At the first sound of it, a museum about the history of wine in the Douro Valley may not sound so appealing. But trust us when we say the museum curators have done a great job with the exhibits to keep things interesting. Oh, a port tasting is included in the entrance fee. We were so lucky to be able to eat at Tasca da Quinta near the Douro Museum. The space is charming and small and the food is absolutely delightful. Do yourself a favor and book a table here the next time you are in town. We saw these kittens outside the front of the Casa do Sao Miguel do Douro each time we left or arrived. We took this as a good sign as we followed the housekeeper to the parking area on our first night. This place may not be for everyone, but we enjoyed a relaxing few days in the valley. An overview of our time spent on the Lisbon Coast. This is a magical area full of so many spots to see and explore. You never know where inspiration will strike. While waiting for the ferry back to the mainland from Berlenga Island a plastic bag floated on the air over the bay, sparking this poem. Our misty and blustery start to our journey to the Berlenga Island off the Lisbon Coast of Portugal opened up to an amazingly beautiful day of exploring with a few surprises along the way. 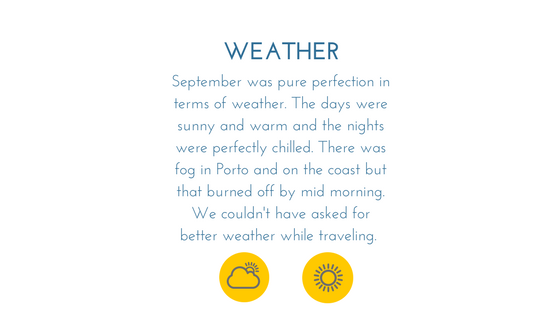 An overview of our time spent in Porto, Portugal. It was love at first site and the affair continued for our entire stay. Portugal is known for many things, and one of them is the variety and abundant use of azulejos, or tiles. There are azulejos on walls and floors and inside and outside of most buildings. If you like tiles, you'll love Portugal, and specifically you'll love Porto! We loved our stay at the Porto Republica Hostel. This was a great base for exploring this beautiful city. We so enjoyed our time here and would definitely book again. Next time, we'll remember to take some photos. Even though we continue to be absolute rubbish at remembering to take photos of our food and the places we eat, we do have some really good recommendations for when you visit. We found the food to be incredible in Porto and think you will too.